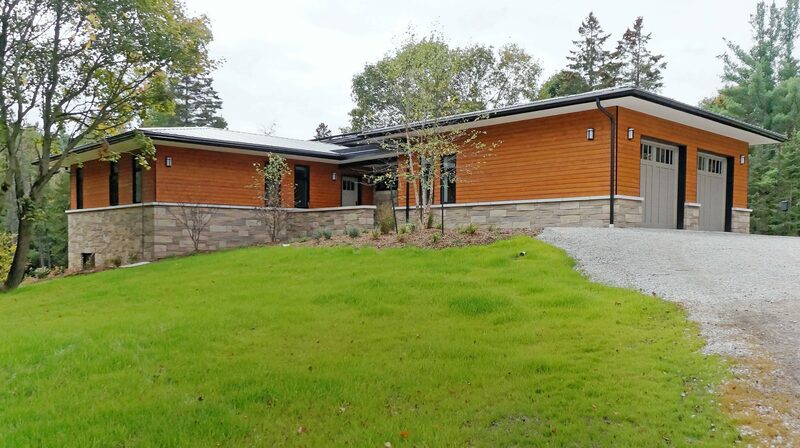 This rural new-build sits on a large picturesque property previously home to a 1970s Viceroy cabin, which was sorely in need of replacement. 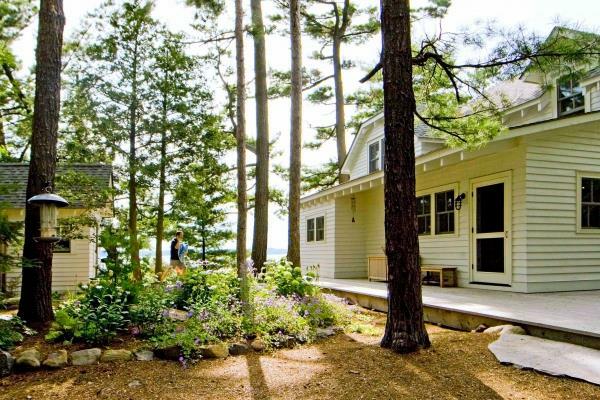 The 49-acre lot the house sits on, however, is a different story. 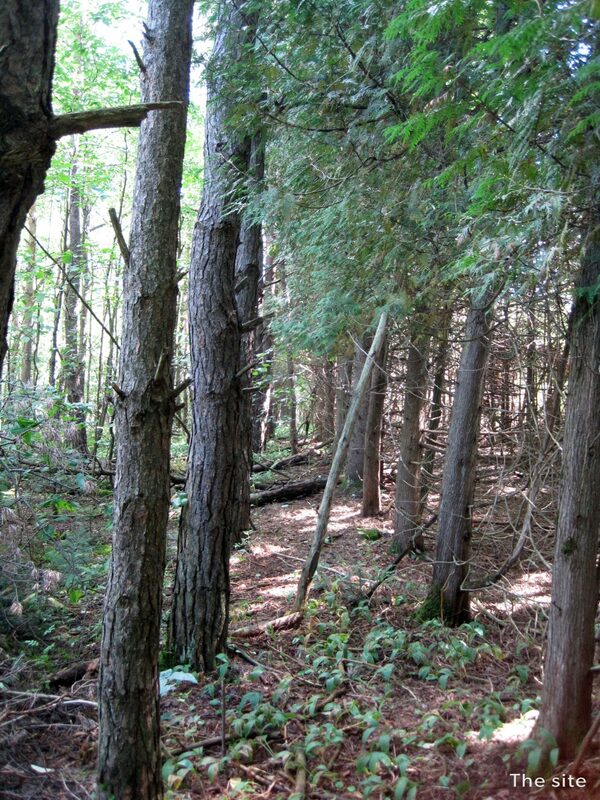 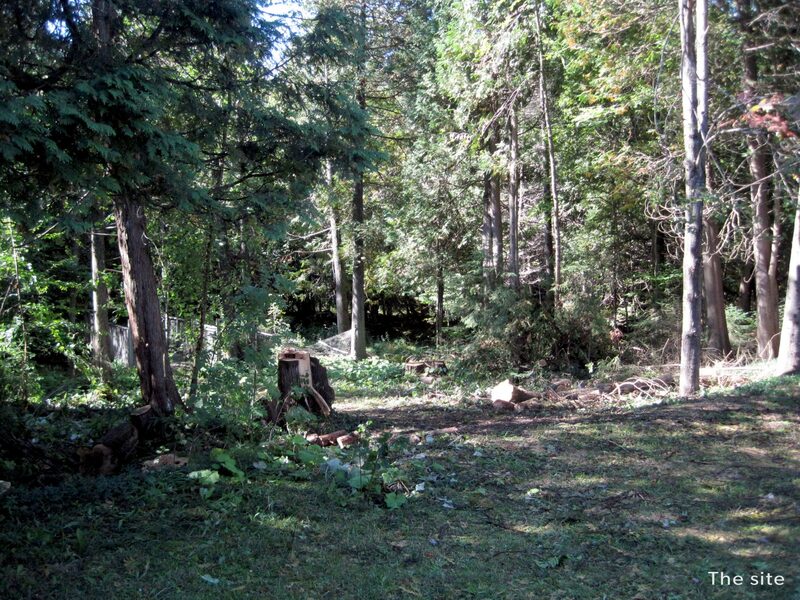 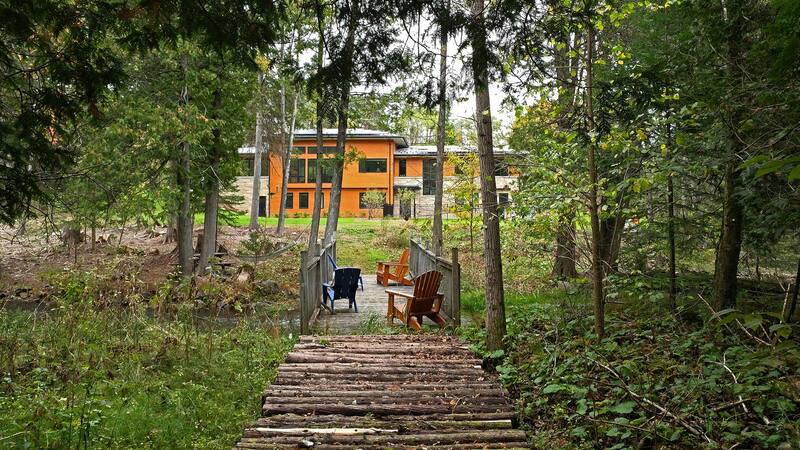 Mature mixed forest stands to the north and west, and a long cedar-lined driveway leads off the property to the east. 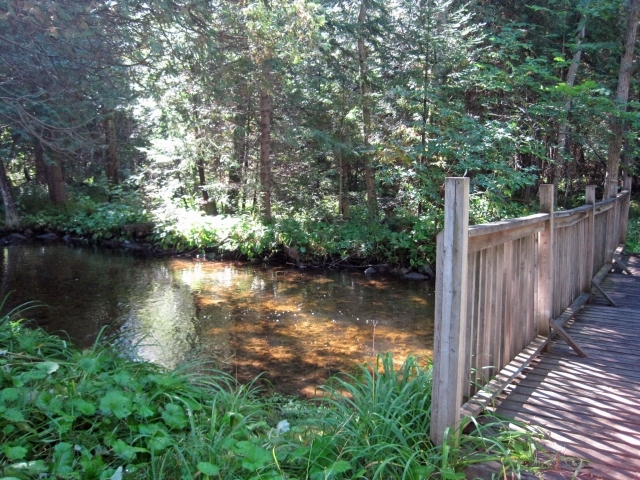 A tributary of the Credit River flows along the property’s south side, crowned by an idyllic footbridge. 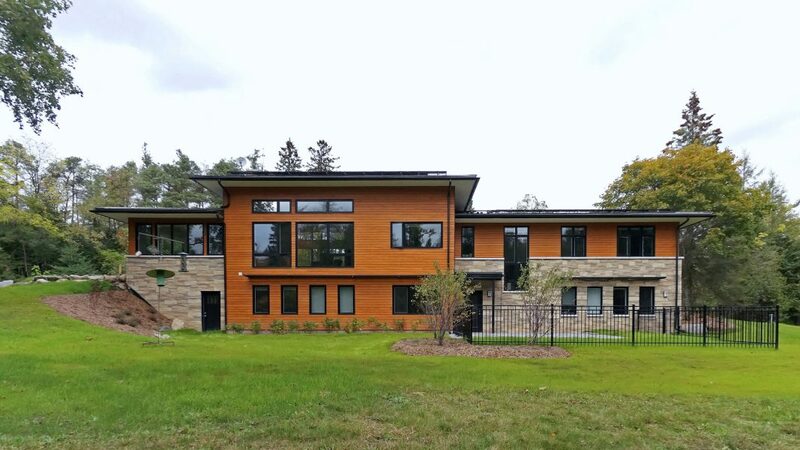 Our clients are fans of architect Frank Lloyd Wright’s warm and stately works, and were inspired by his organic and Usonian architecture of the 1920s and 30s. 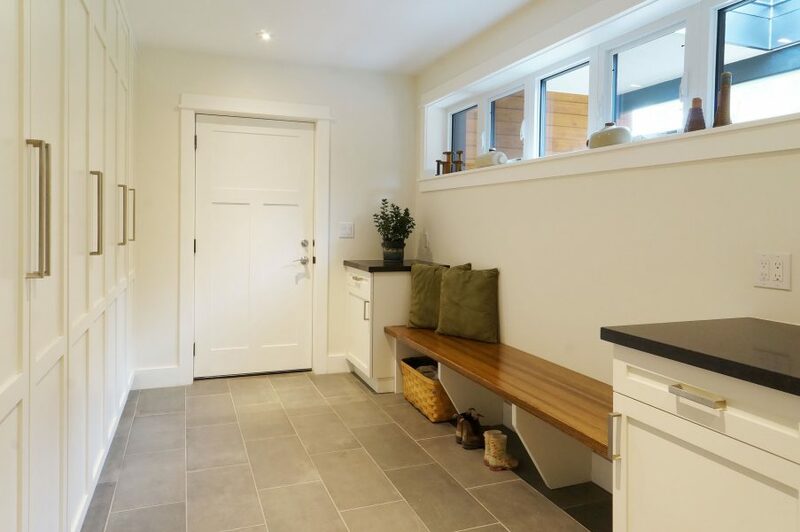 The home’s aesthetic is clean, warm, and tranquil, and materials were carefully chosen to reflect the palette of the surrounding landscape. 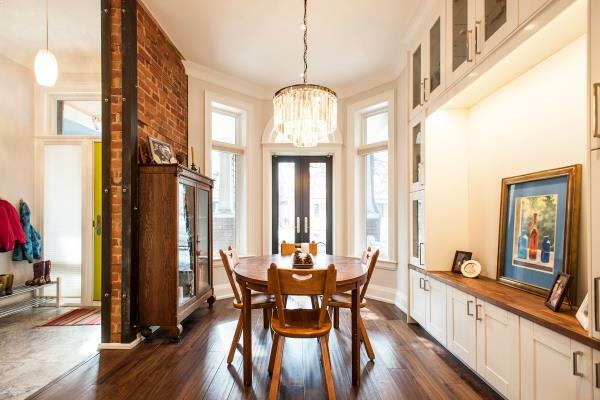 The couple’s furniture collection is extensive – largely wooden Mission pieces with intricate detailing – and is showcased in the home. 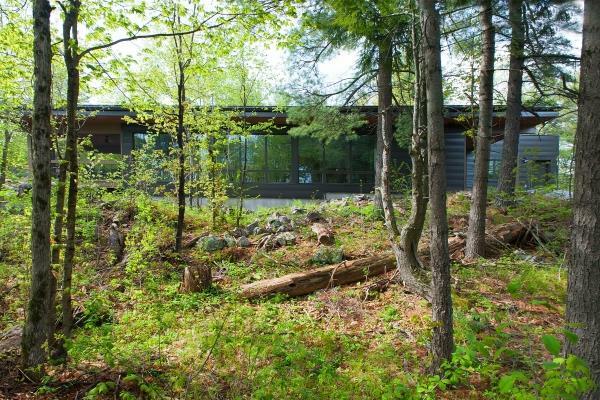 The new building is organic with compressed spaces leading to expanded ones, and an integrated relationship with the surrounding landscape. Each floor is 2,000 sq.ft. 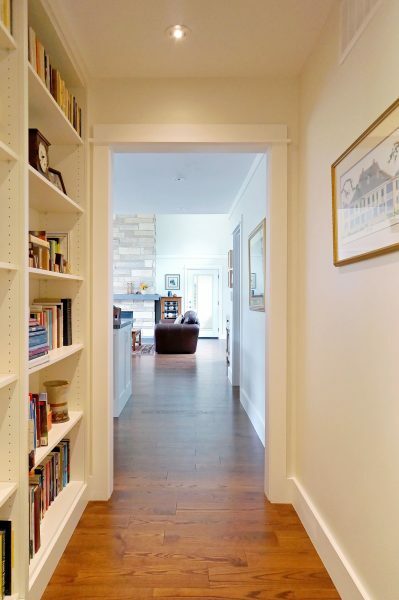 with a generous walk-out from the finished lower level. 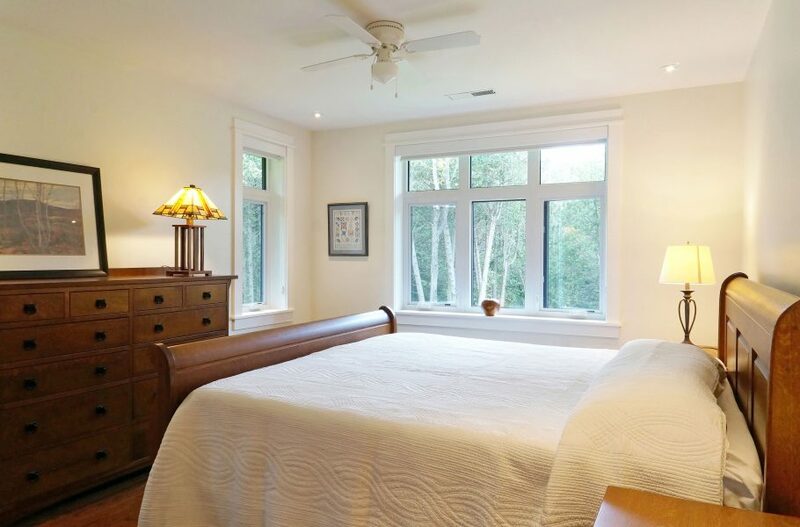 Every room has a gorgeous view of the forest and river. 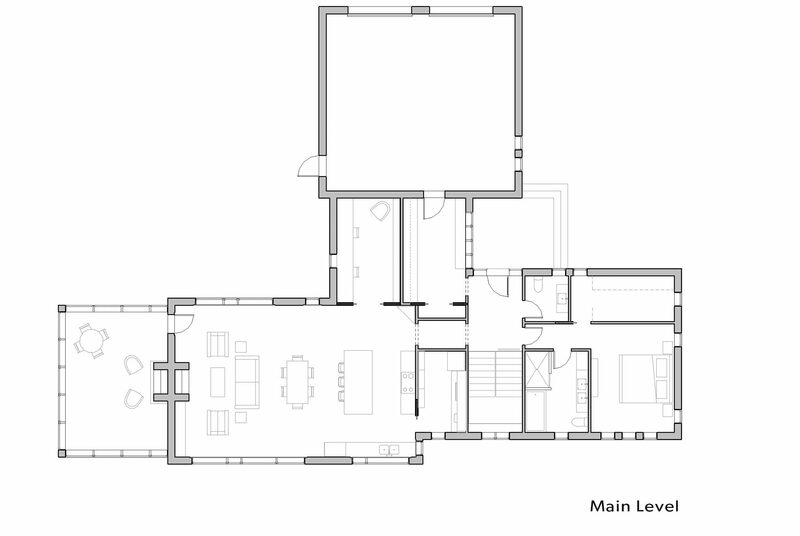 The 2000 sq.ft. 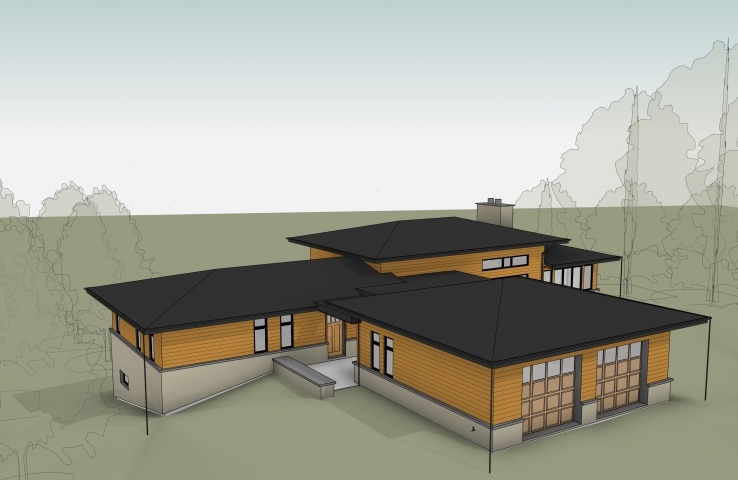 home is a bungalow with a walk-out basement from the south, river-facing side of the house. The first floor makes up our clients’ day-to-day home, and the walk-out basement acts as a separate 2-bedroom suite for their oldest son and his family. Upstairs, a double garage connects to a mud room adjacent to the front entry. 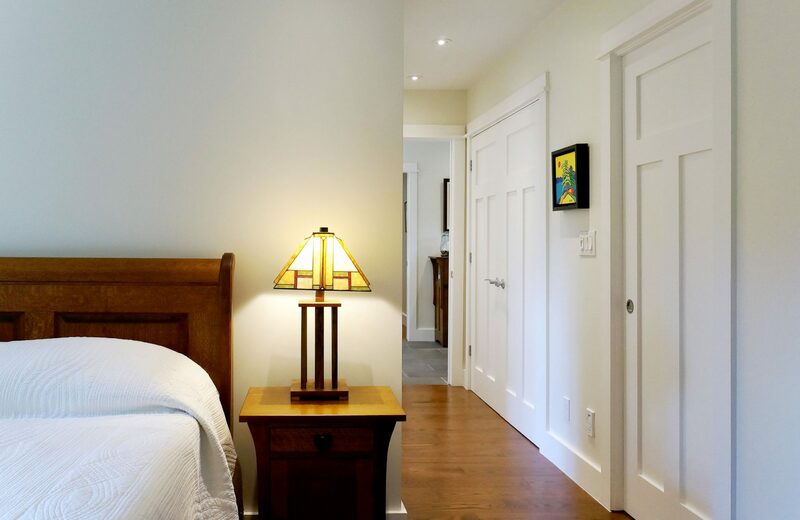 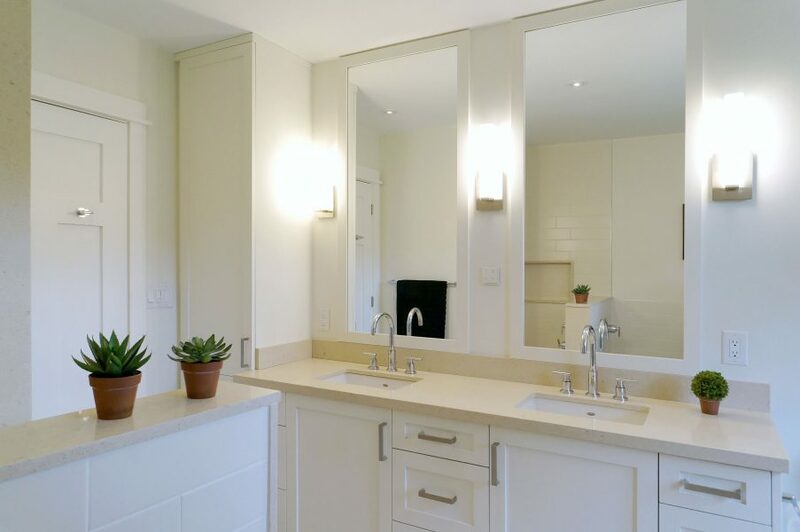 The master bedroom is located off the entry, with walk-in closet and ensuite bathroom. On the other side of the entrance, a compressed hallway leads to a large, open-concept Great Room. 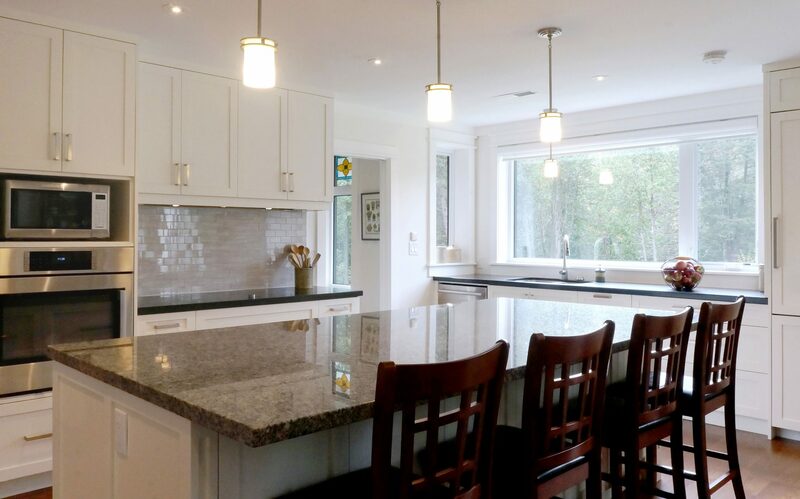 The kitchen has three zones: a cooktop area, an island for food prep and quick meals, and a sink area for easy clean up. 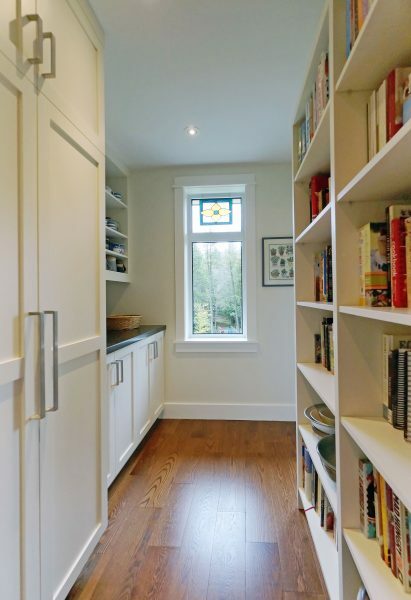 An adjacent walk-in pantry offers more counter space and floor-to-ceiling shelving for an extensive cookbook collection. Past the kitchen sits the Great Room, a dining and living zone with a near 14’ ceiling, huge windows on the south and north and a central stone-clad fireplace on the west end wall. 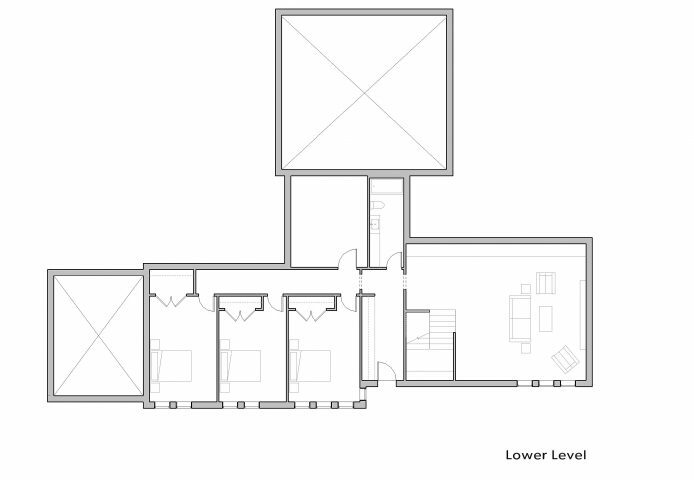 An office is located off the north side of the Great Room, and to the west is a large sun room. 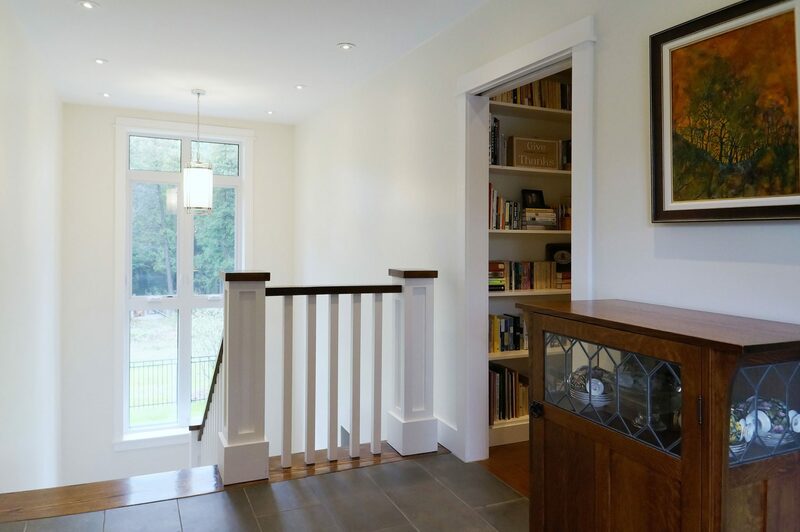 The basement has an entrance from the first floor as well as a private entrance from the outdoors, so the clients’ son and his family can have their privacy when needed. 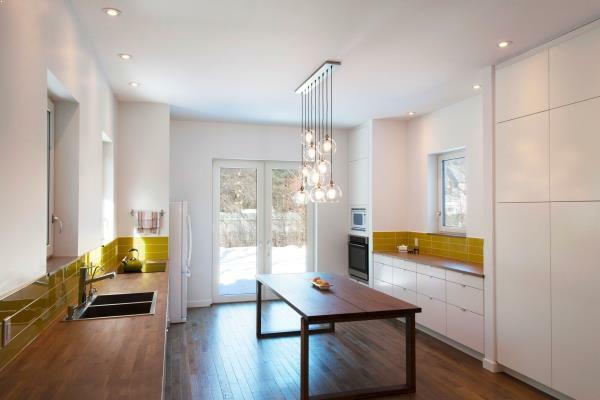 The basement has two bedrooms, and office/guest room, a bathroom, and an open-concept Great Room of its own with kitchen, living and dining space. 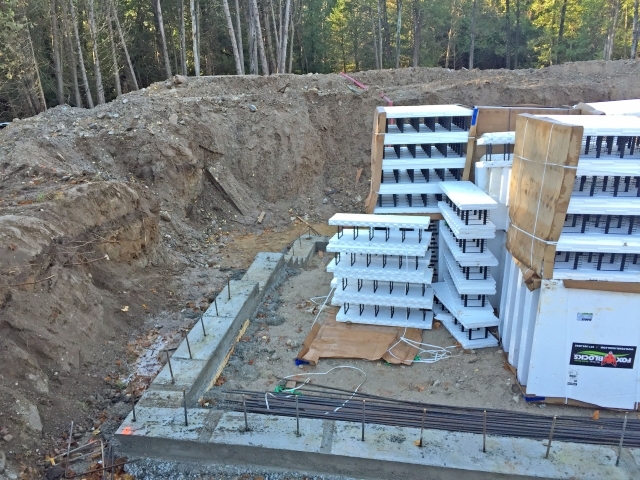 Concrete footings were put in place below a foundation of ICF (Insulated Concrete Form) blocks. 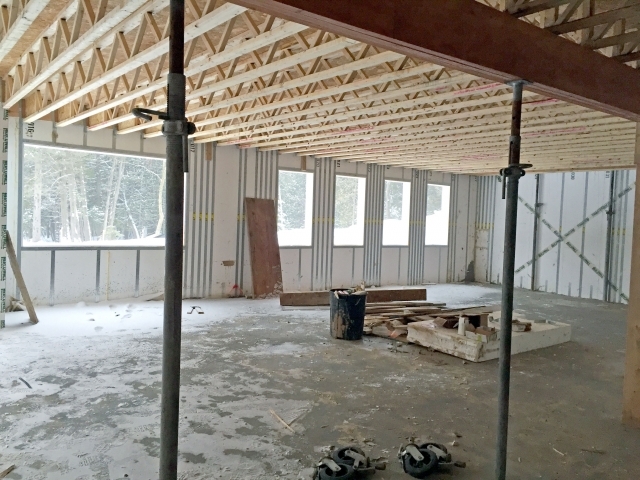 On top of the foundations sits a Hercuwall frame, which is a composite concrete and steel structure that does multiple jobs: structure, insulation, water and vapour barriers, and window and door casings and sills. 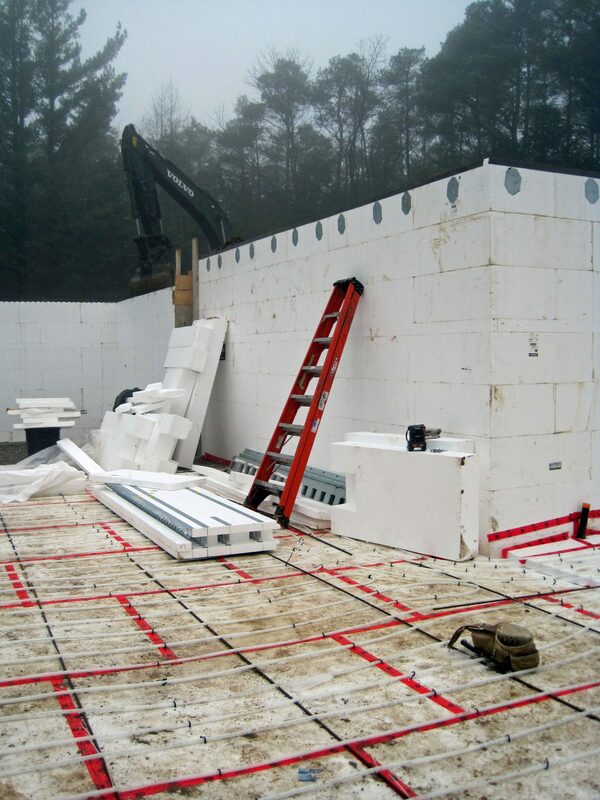 Even though Hercuwall is thinner than ICFs by two inches, Hercuwall’s R-value is higher at R33 compared to ICFs’ R24). The panels also use less than half the amount of concrete than ICF, and no wood or timber. 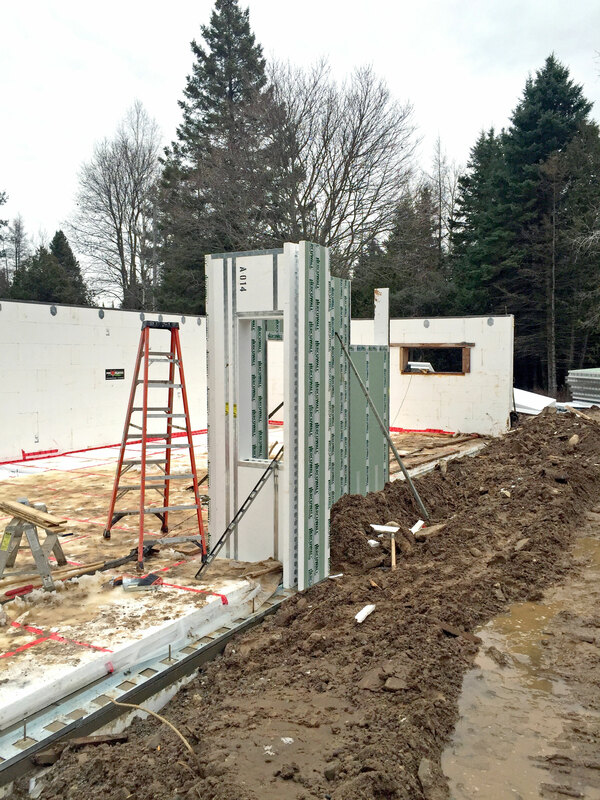 Panels arrive on site in custom sizes matched to the building’s design, making installation a breeze. 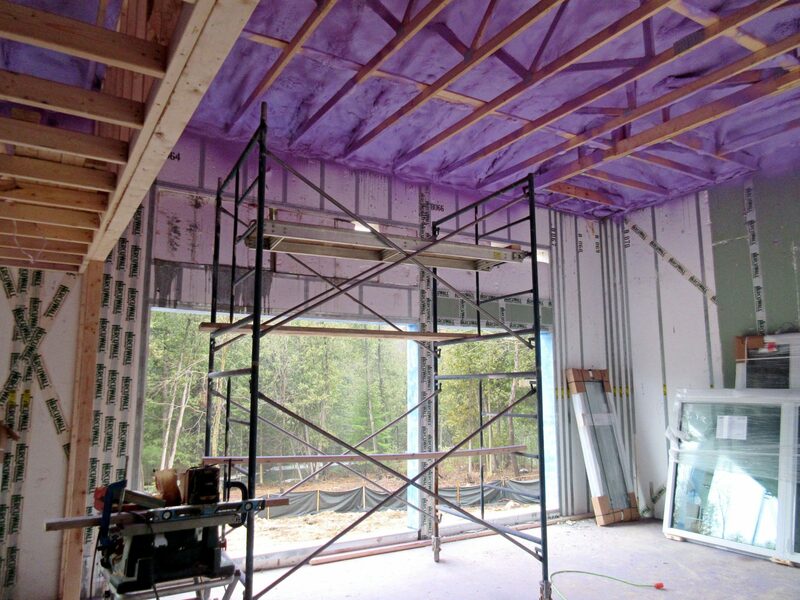 With the Hercuwall structure, all we had to do to ensure air tightness was to tape the joints, and then tape to seal the windows to the walls, and the walls to the roof. The roof and floors are built with engineered floor and roof trusses, instead of conventional joists. 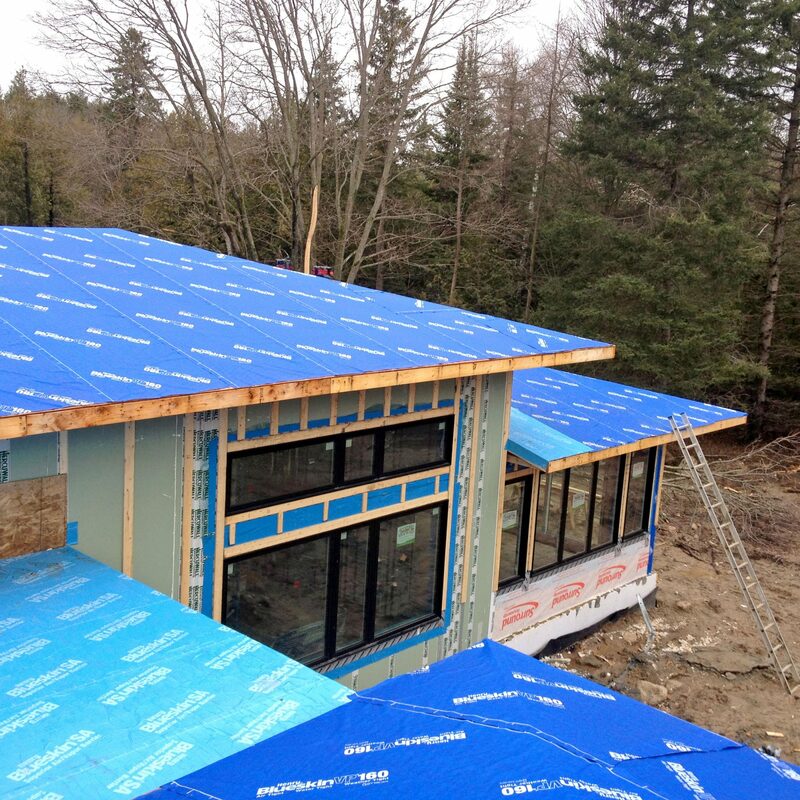 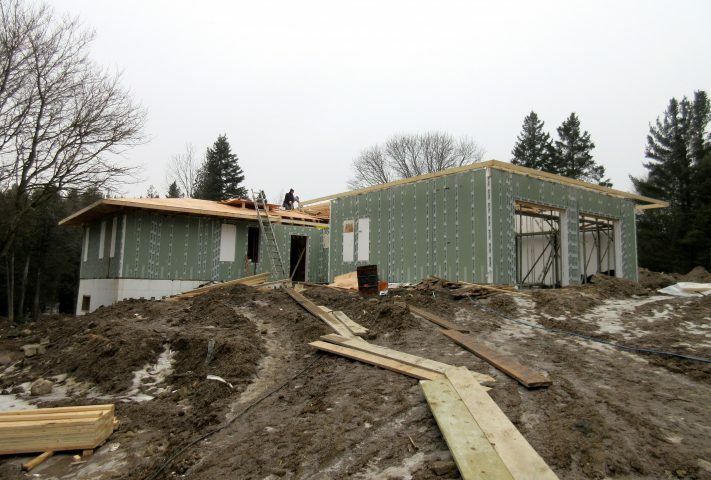 For roof insulation, we applied spray foam on the underside of the sheathing, which works triple-duty as insulation, air barrier and vapour barrier. The roof’s exterior is sheet steel affixed onto strapping, which promotes ventilation behind the cladding. 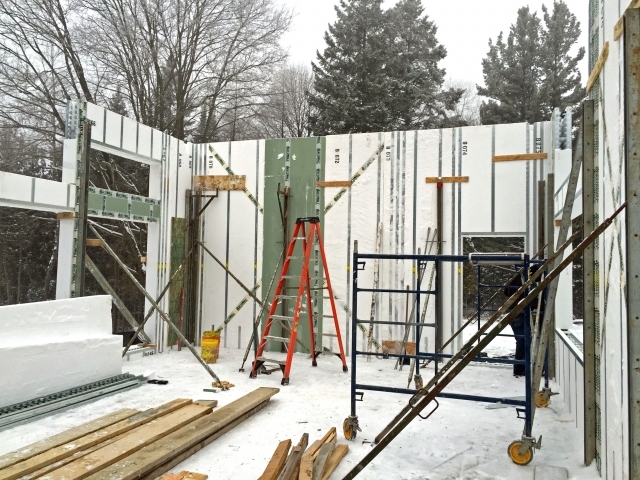 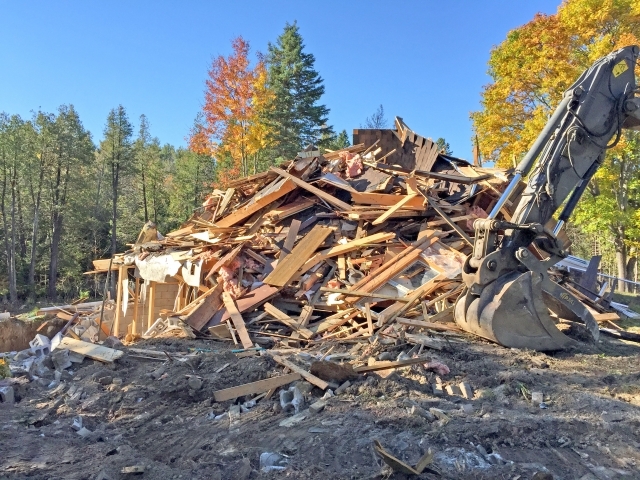 The home’s warmth comes from two key elements: a gas boiler and a wood-burning fireplace. 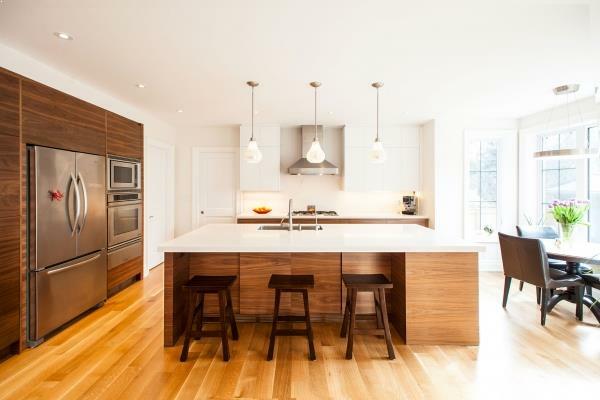 The gas boiler by HTP is fuelled by a large propane tank and powers in-floor heating pipes. 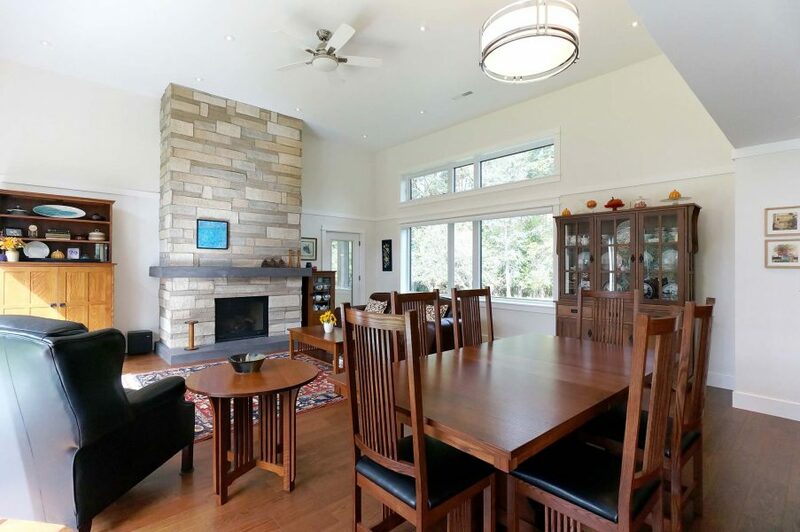 The living room’s wood burning fireplace helps offset the demand on the in-floor heating system. 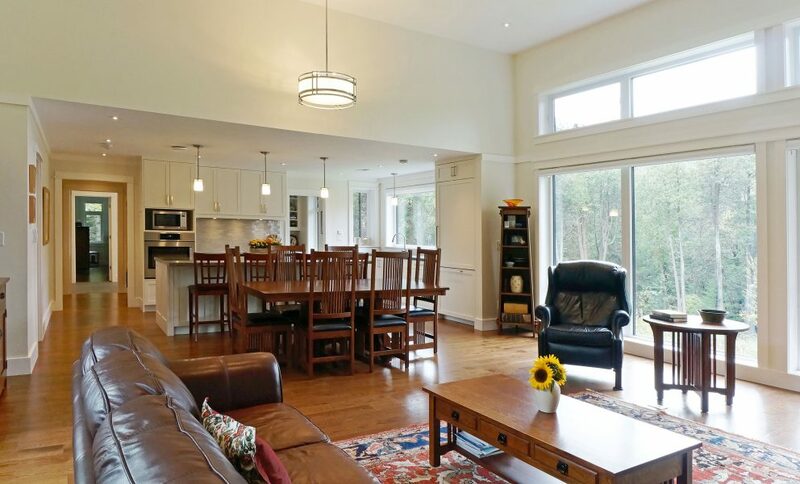 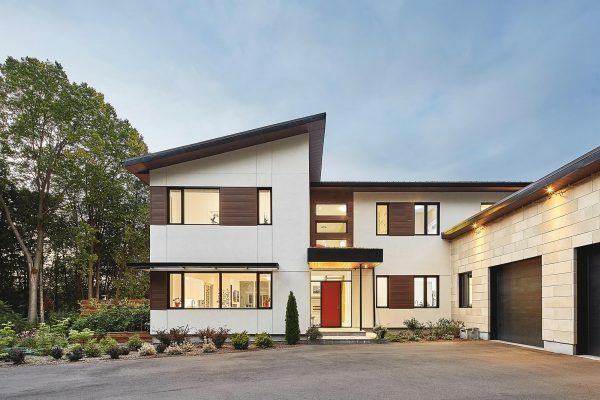 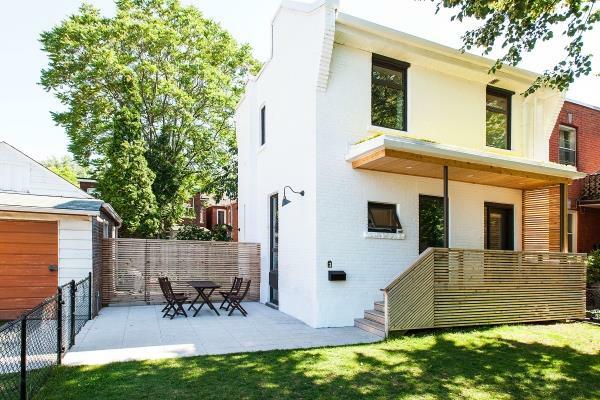 For cooling, the house has a forced-air system, powered by an energy efficient heat pump and equipped with its own ductwork, which disperses cool air uniformly through the house. 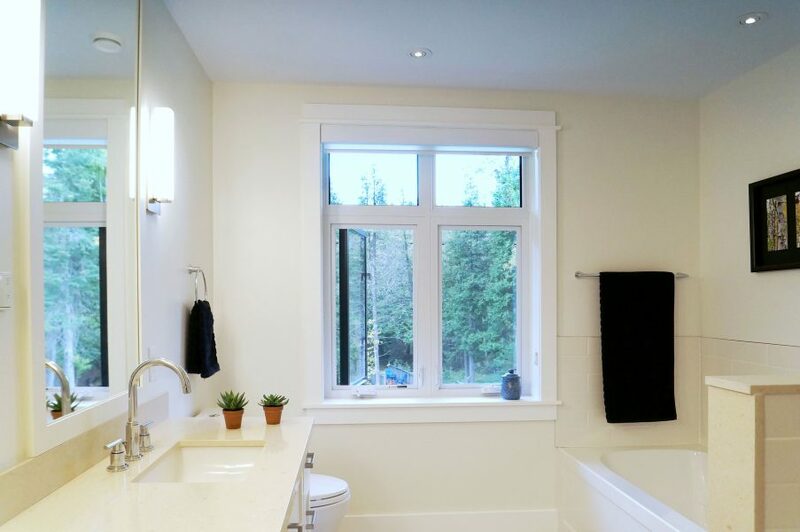 Ventilation is provided by an extremely efficient and innovative HRV (Heat Recovery Ventilator) unit by Zehnder, with its own separate ductwork. 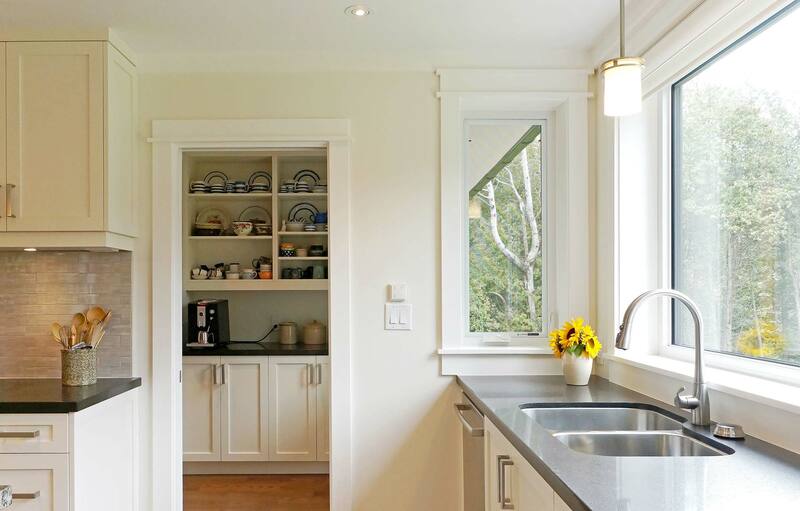 The windows, by Accurate Dorwin, are high quality, durable, triple-glazed and fiberglass-framed. 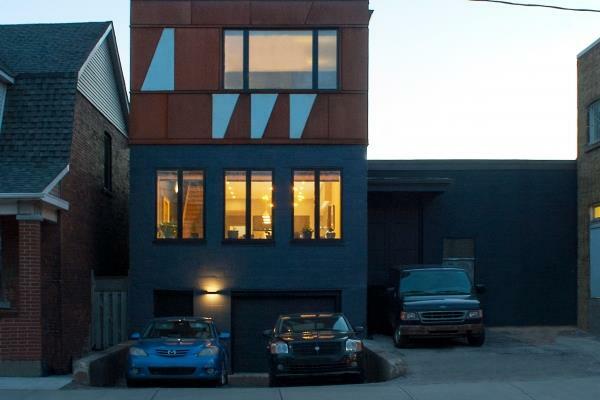 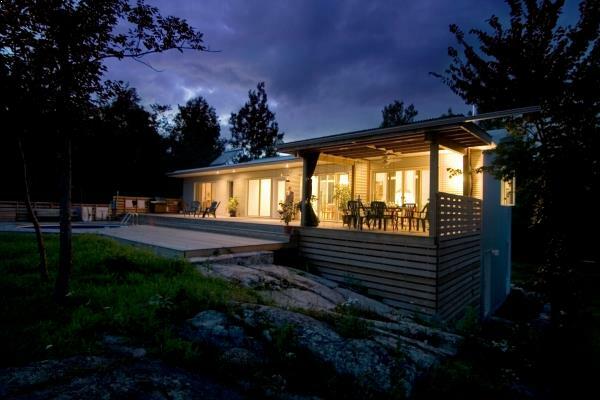 Exterior cladding is a finished wood siding by a Canadian company called Maibec. The house was roughed in for solar panels, and the clients connected them to the Ontario MicroFit program.